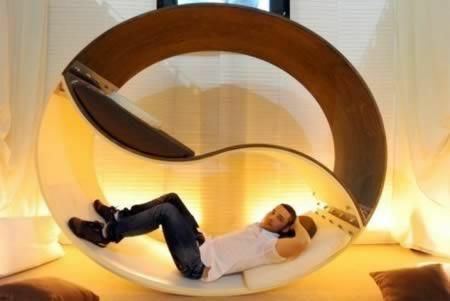 Creative Yin Yang bunk bed created by Italian designer Alessio Pappa. 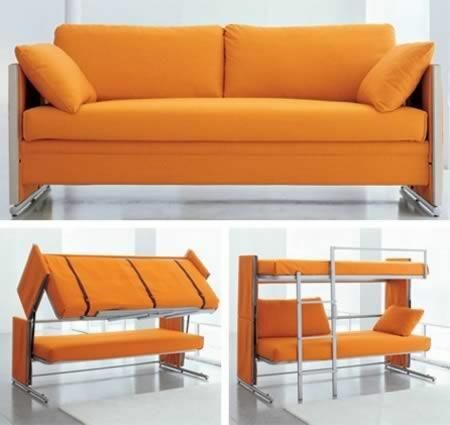 Sure we’ve all seen convertible sofas that transform into a double bed, and even easy chairs that convert to single beds, but have you ever seen a couch that can become bunk beds? Now you have with the space saving Doc couch from Resource Furniture. The cover is fully removable for easy cleaning and there is an integrated ladder. Working with an Atlanta-based design team of architectural designer William T. Baker, landscape architect Alec Michaelides,and interior designer Suzanne Kasler, Tom and Leah Crowley spent two years planning how to turn their vision of a family-friendly compound outside Indianapolis into a reality.All of the Crowley youngsters use the bunk room as a play space, and it’s the hub of activity for sleepovers with friends and cousins. The built-ins were wired to allow for reading lights above each bed. Called “Wave 2”, this bunk bed features a unique design shaped like a work of architecture. 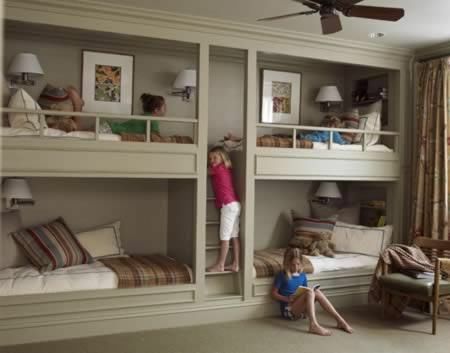 Just climbing up to the top bed is a real treat for kids. Wave 2 comes from Mimondo and can be found here. 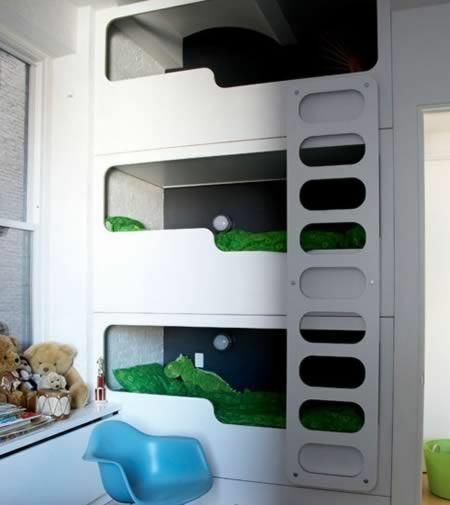 Bunk beds are a great space-saver in children’s bedrooms. This futuristic boxed-in design gives each child an element of privacy, along with their own reading light, so there’s no argument about who turns the light off at bedtime. The simple white and green colour scheme keeps the look fresh and is easily adaptable as the children grow older. Surf’s up! Your child will love this Tropical Surf Shack Bunk Bed as they shimmy up the ladder or zoom down the slide. This tropical tree house theme bed features real bamboo, thatching, and palm tree inspired leaves to create the ultimate island experience. The bad news? It costs $16,000. The good news? Free shipping. 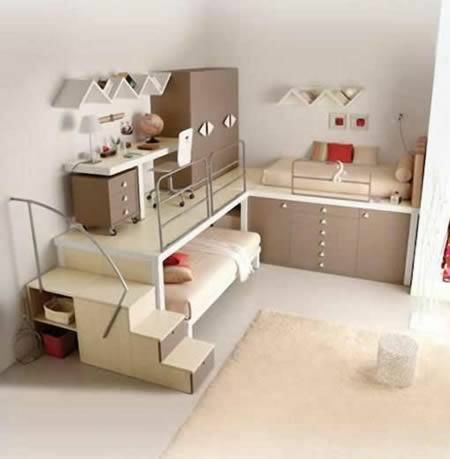 These cool bunk beds and teenager’s bedroom are designed by Tumidei. 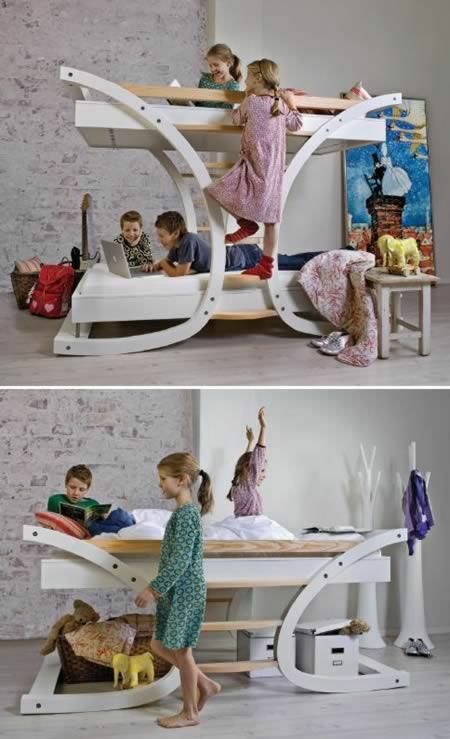 Could this be the coolest bunk bed ever? Why? 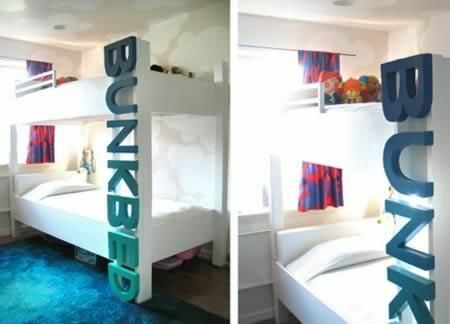 This custom bunkbed’s lettering doubles as a ladder. 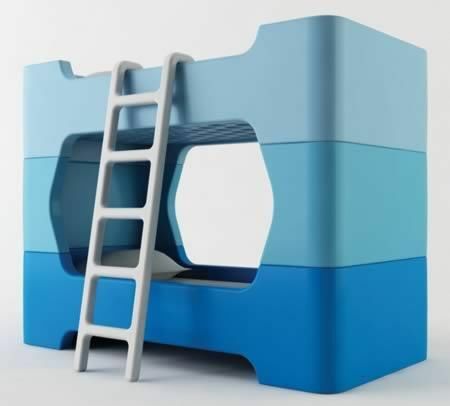 Created by designer Marc Newson for the Italian furniture company Magis, these bunk beds are simply four pieces of molded polyethylene with easy to wipe, smooth surfaces. Reminiscent of the plastic toys we all grew up with, the color and texture at human scale smash our Lilliputian fantasies, giving us a cozy place to rest and hide, this time at the scale of G.I. Joe figurines. This ain’t no bed. It’s a toy. Or a bed. And a toy. A little bit of creativity, clean harmonious lines, no clutter, a little light and sometimes a lot of light do the magic for Nainesh Jain Designs interiors. 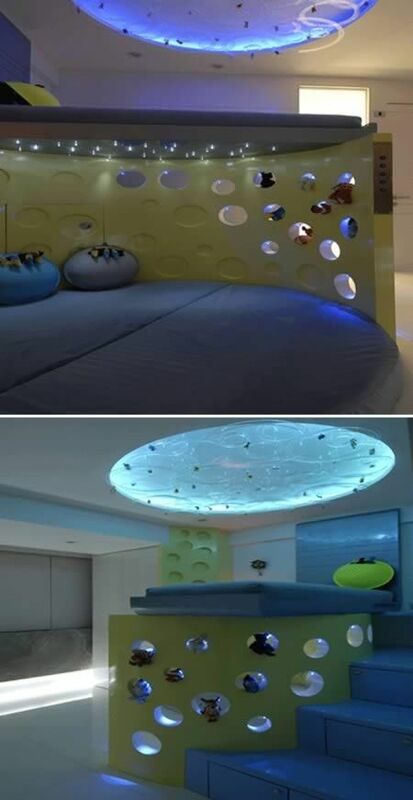 The round bed, colours, dramatic light and baubles tell you the story of a child living here! Actually, not one child but two! Can you see the upper deck/bunk bed?